A major goal most cyclists embrace at some point is the century ride–a single-day 100-mile journey. New England abounds with a variety of classic century rides from the legendary Flattest Century in the East along the flat seacoast of Southern New England to the epic Mount Greylock Century that includes nearly 10,000 feet of climbing in Massachusetts’ Berkshire Mountains. Many of these organized club century rides also include shorter options, such as the metric century at 100 kilometers (62 miles) and the half century at 50 miles. The variety of terrain in New England and the variations on the century theme provide a wide array of options for you to establish your personal goals for the upcoming season. Here are descriptions of three challenging century rides from the guide book Road Biking Massachusetts that can be found within a short driving distance of Boston. Half Century (50 Miles): Petersham Challenge. The Petersham Challenge will take you through the peaceful but steep hills of Central Massachusetts for a tour of quaint New England hilltop towns near the mighty Quabbin Reservoir where four towns were “discontinued” to establish a reservoir that holds 412 billion gallons of drinking water. You’ll visit Barre, North and West Brookfield, and the blink-and-you’ll-miss-it New Braintree town center. The ride begins in quaint and quiet Petersham with its inviting town common and convenient general store, which boasts a full breakfast and lunch menu. The towns are quaint and the scenery is stunning, but be prepared for a good workout – the hills are frequent and steep. Metric Century (62 Miles): Bolton Berlin Challenge. Route 495 is often viewed as the demarcation point separating the greater metropolitan Boston is from Massachusetts’s vast rural areas. Nowhere is this more apparent than on the Bolton Berlin Challenge. The convenience of the highly developed starting area in South Acton is quickly contrasted by long open stretches of country roads where fast food – or any type of modern convenience – disappears. Many of the roads go mile after mile without even passing a house. Load up on supplies before heading out on this one, there’s only one real stop for food and restrooms along the way. That inconvenience is easily outweighed by the beauty of the expansive views you’ll enjoy at the top of the route’s climbs and the winding descents that are each climb’s reward. Your camera won’t capture many historic sites on this route; this is a ride for bonding with nature rather than sightseeing. 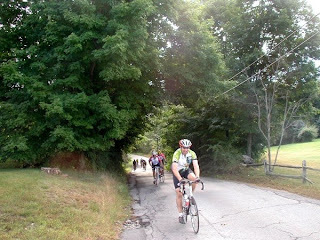 Century (100 Miles): Mount Wachusett Classic. This is no ordinary century ride. This is an epic journey through Central Massachusetts from historic Concord to peaceful Princeton where solid rock juts up 2,000 feet toward the sky to form Mount Wachusett. A great family spot for skiing in the winter, the mountain also provides a great challenging climb for cyclists during the warmer months of the year. A quick glance at the course profile will show you that the mountain isn’t the only climb along the route. Pack well, be sure you’re fit and embark on a classic cycling adventure based on the very popular and aptly named “Climb to the Clouds” ride run annually by the Charles River Wheelmen. Tom Catalini is the author of Road Biking Massachusetts, a cycling guide book available on Amazon.com, and cycling blog www.RoadBikingMassachusetts.com. Road Biking Massachusetts features forty carefully designed rides throughout the state, from the summit of Mount Greylock to the tip of Cape Cod and everywhere in between. Local cyclist Tom Catalini provides a sampling of the state’s diverse offerings, including rides in the rugged Berkshire Mountains, through scenic Nashoba and Pioneer Valleys, around the historic North Shore, and along Boston’s picturesque South Shore to Provincetown. Rides for every fitness level and ability, from and easy 17-mile ramble to a challenging 124-mile classic. Detailed information about each ride, including directions, length, terrain, traffic conditions and road hazards. See www.RoadBikingMassachusetts.com for more details. Purchase at ww.Amazon.com or your local bookstore.